University of Texas at Arlington’s Ernest H. Hereford has KKK, racist past | Fight Back! 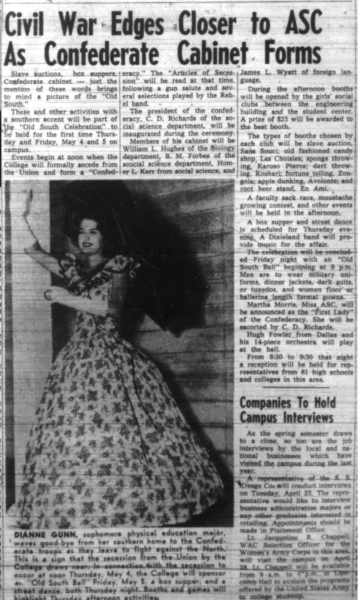 Shorthorn article from April of 1961 that goes into detail on the 'mock-slave auctions' present at U.T.A. Arlington, TX - University of Texas at Arlington (UTA) has a bust, and the University Center named, in honor of one of its first Presidents – Ernest H. Hereford. The bust was commissioned in October of 1958, a month before his death, and the center was renamed in his honor in February 1959 by the Texas A&M system. For almost 60 years the bust and center have stood at the University. But it has come to light, due to research done by Progressive Student Union, that Hereford had principally, intentionally and purposefully created an environment on campus where racism was welcomed and celebrated; where the K.K.K. was an officially recognized student organization; where mock-slave auctions were school-authorized events; and where the Confederacy’s symbols became synonymous with the school, due to Hereford’s sanctioning and drive to make it so. The KKK, otherwise known as the “Davis Hall Klansmen” or “Kampus Kadet Klub,” was a student organization on campus that existed from 1946 to 1956 during Hereford’s administration. They were heavily featured on the social calendars at the time, calendars which needed approval from his administration. They hosted the ‘KKK Dance’ and ‘KKK Nite Club’ events, but also were in charge of the military balls and the annual homecoming bonfires that were put on by the larger school. The fact for a large portion of its existence, the KKK co-existed around the Rebel theme developments and the mock-slave auctions. This shows the type of environment that Hereford sought to cultivate and propagate – one that welcomed the Klan’s ideology and the Klan as an institution. While the Klan student group eventually dissolved in 1956 due to uncertainty of continuing it for another semester, the Klan’s ideology would outlive it through the Rebel theme. The Rebel theme would far outlive Hereford himself, who died in 1958, by at least another ten years for the Beauregard Battle Flag and 13 years if we specifically talk about the Rebels mascot. Finally, mock slave auctions were a common occurrence at homecoming under Hereford. They were tolerated, school sanctioned events that, after his death, would become their own events known as “Old South Days” in the 60s. The Shorthorn itself would actively promote these events, as they were official events put on by the school. Progressive Student Union has been putting up a petition to get the Hereford statue removed, the University Center renamed, and to set up a memorial dedicated to the three men, Ernest Hooper, Jerry Hanes and Leaston Chase III, who forced UTA to desegregate in 1962, as well as those who fought against the Rebel theme in the 1960s and early 70s.